City planners, politicians and architects need to take a walk in the slow lane, Berthelsen says. 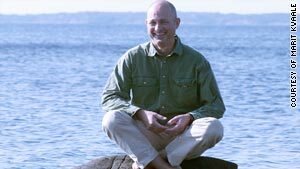 Editor's Note: Geir Berthelsen is a motivational speaker and founder of the think tank The World Institute of Slowness, which promotes "slow" awareness and activities around the globe. (CNN) -- The Industrial Revolution gave us many good things, among them the ability to create large, great cities and feeding enough people to populate them. As a consequence we have adopted a corporate mind-set which is long on quantity, short on quality, and even shorter on slowness. Urbanization changes the social organization and patterns of our lives. Our culture's omnipresent corporate mind-set affects our mind with new challenges, which we as humans have not had to deal with before, leaving many of us feeling alienated from the world as it is. Today, people all over the world are still flocking to the cities. It is not only a demographic movement but it is about people and families moving in search of a better life. Many of us have become alienated from the world as it is and millions of people face problems of poverty, overcrowding, pollution, violence, lack of social support and loneliness. The challenges of urban living and urban growth are not going to be about the "hard issues," they are going to be about "soft issues" and taking back control over our time. We've forgotten that there is more than one dimension to time. We have something to learn from the ancient Greeks who said time has two dimensions: chronos and kairos. Chronos is linear time while kairos is the time when special events happen -- what the Greeks called "the supreme moment." This "supreme moment" is "slowtime!" To create great cities, we need to promote human interaction based on basic human values. In his poem "The Paradox of Our Age," the Dalai Lama says: "We've been all the way to the moon and back, but have trouble crossing the street to meet the new neighbor. We've built more computers to hold more information to produce more copies than ever, but have less communications." The consumer's basic needs seem to be: more and faster. Consequently, our postmodern society is often compared to a rat race. But as the American actress and comedian Lily Tomlin once elegantly put it: "The trouble with the rat race is that even if you win, you're still a rat." The postmodern world has brought us more education and more knowledge, but psychologists tell us that a person's basic needs are belonging, care and love. To fulfill these needs we have to accept that we are not rats and life is not a race. These values can only be reached if you have slowness in human relations. The Slow Revolution will facilitate a better balance between chronos and "slowtime." History teaches us that unplanned urbanization causes negative consequences for people in cities. To create great cities, we need to promote human interaction based on basic human values. To achieve this city planners, politicians, architects and real estate developers need to take a walk in the slow lane and focus on solving the challenges of poverty, overcrowding, pollution, violence and lack of social support. And the focus must be on belonging, care and love. These values can only come through slowness in human relations. Cities built on these principles will affect their citizens in such a way that they will have better health and more opportunities to live a good life -- which gives us more time to do the things that are worth doing. The opinions expressed in this commentary are solely those of Geir Berthelsen.